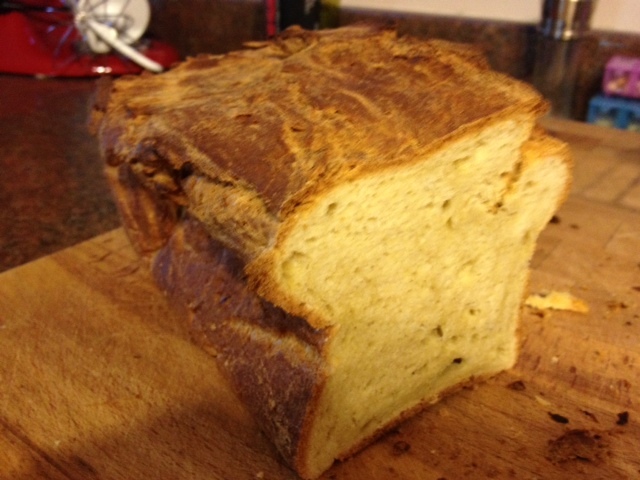 I have tried a few bread recipes now and have had varying success. In the beginning of my gluten free adventures, I tried a French Bread mix that tasted more like baking powder biscuits than bread. It didn’t take long for me to decide that I would have to learn how to make gluten free bread myself. I started toying with the idea of buying a bread maker that had a gluten free setting. But as I started trying different bread recipes, I realized that GF breads are a bit easier than gluten breads because you do not need to knead and rise, knead and rise – you can just rise and bake, which hardly makes a bread maker worth it in my opinion. I may change my mind if baking bread becomes too time consuming. But right now I am still enamored with my new Kitchen Aid mixer and revel at every opportunity to use it. I tried a sandwich bread recipe that turned out really well the first time, but then didn’t work out the following two times. The photo is of the first loaf of bread I made with this recipe. The first time, I skipped the flax meal and the vinegar called for in the recipe and it was wonderful. 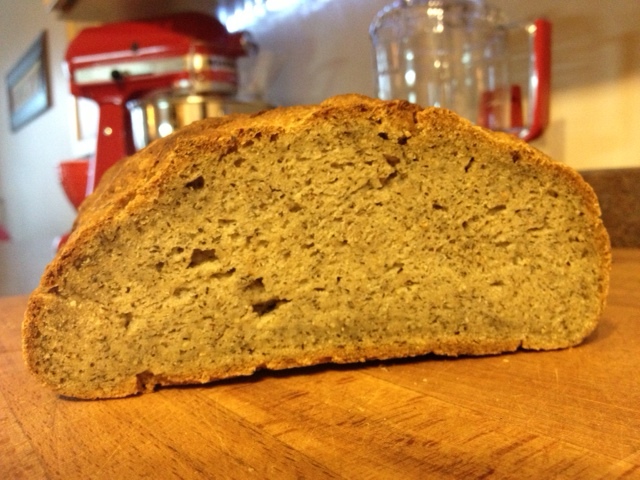 With the flax meal (still skipped the vinegar), it was dense and didn’t rise well. It did make rather delicious stuffing for Christmas dinner though. The Christmas dinner leftovers are what led me to make the Gluten Free Crusty Boule recipe from The Gluten Free Girl, again. I wanted yummy, hearty, soft bread for turkey sandwiches. This bread does not disappoint. I have made this bread a few different ways. Straight up as the recipe says, rising it for two hours, shaping it, rising it, then baking it. I’ve kept it refrigerated then baked it later in the week, that was delicious (see Bread in Five* for instructions on refrigerating then baking). I’ve added dried fruits for a holiday fruit bread, then glazed it with a cardamom glaze, I’ve added herbs for a delicious herb bread. As you can see, I really love this recipe! This bread is such a relief to me. I was tired of hard bricks of bread that fall apart unless you toast them, then even still you have to finish eating your sandwich with a knife and fork. I was tired of dried out pucks of gluten free starch from the freezer with little nutritional value. This bread is easy, delicious and actually feels and tastes like bread. Thank you, Gluten Free Girl! As stated above, I find this recipe really easy. But, when I first read it, I was intimidated by the dutch oven and figuring out how to bake the bread without a dutch oven. After reviewing many other recipes, this one definitely sounded like the winner. So I decided to wing it and just bake the bread on a parchment lined cookie sheet at 450° F. I am glad I did. Get a rise out of it! Bring your ingredients to room temperature before you mix them; this will help the dough rise. You can put your eggs in a bowl of warm water. If you are using egg whites from a carton, simply measure them out into a bowl and then stack that bowl on top of another bowl with hot water in it – like a double boiler. *This recipe was developed by the Gluten Free Girl and The Chef for the folks at Bread in Five. The recipe appears on both websites (linked above). I like the larger size of the recipe on Bread in Five but prefer the layout of the instructions on the Gluten Free Girl website because I do not need photos with my instructions. If you prefer visual aids to know how your dough should look at different stages, you may prefer the Bread in Five website.